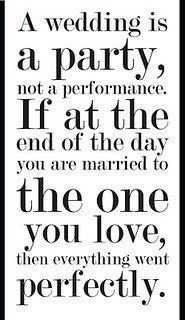 While we love planning exquisite, elegant, perfect weddings, I want each of my brides and grooms to remember the quote above. The day will be perfect because you're marrying each other. We'll add the icing on the cake by making it the best day possible, helping you create memories for a lifetime. p.s. want help planning your perfect wedding? Give me a call!